A software release lifecycle consists of different stages that report the stability of a piece of program and the amount of development is necessary before the final release. It is the distribution of software code, documentation, and support materials and composed of discrete phases that describe the software's maturity as it advances from planning and development to release and support phases. Each version of a product goes through a stage when new features are added, or the alpha stage, a stage that is being actively debugged, or the beta stage, and finally a stage in which all major errors have been removed, or the stable phase. Intermediate stages may even be recognized. The stages can be formally announced and regulated by the developers of the project, but sometimes the terms are used informally to report the status of a product. Pre-alpha refers to all activities performed during the software project prior to testing. These activities can include requirement analysis, software design, software development and unit testing. 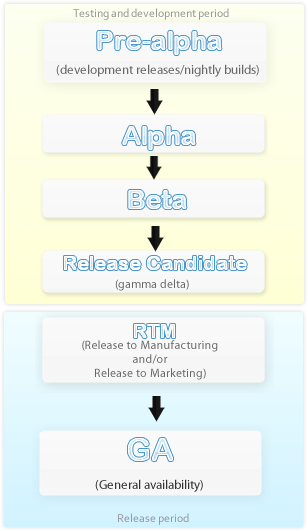 The alpha phase of the release life cycle is the first phase to begin software testing (alpha is the first letter of the ancient Greek alphabet, used as the number 1). In this phase, developers generally test the software using white box technique. Additional validation is then performed using black box or gray box techniques, by another testing team. Moving to black box testing inside the organization is known as alpha release.Alpha software can be unstable and could cause crashes or data loss. The exception to this is when the alpha is available publicly (such as a pre-order bonus), in which developers normally push for stability so that their testers can test properly. External availability of alpha software is uncommon. Beta is the software development phase following alpha (beta is the second letter of the ancient Greek alphabet, used as the number 2. It is not nowadays usual to speak of a later gamma test). It generally begins when the software is feature complete. The focus of beta testing is reducing impacts to users, often incorporating usability testing. The process of delivering a beta version to the users is called beta release and this is typically the first time that the software is available outside of the organization that developed it.The users of a beta version are called beta testers. They are usually customers or prospective customers of the organization that develops the software, willing to test the software without charge, often receiving the final software free of charge or for a reduced price. Beta version software is often useful for demonstrations and previews within an organisation and to prospective customers. Some developers refer to this stage as a preview, prototype, technical preview (TP), or early access. Other Greek letters, such as gamma and delta, are sometimes used to indicate versions that are substantially complete, but still undergoing testing, with omega or zenith used to indicate final testing versions that are believed to be relatively bug-free, ready for production. The term "release to manufacturing" or "release to marketing" (both abbreviated RTM, initials also commonly used for the quite different "return to manufacturer" of faulty goods)—also known as "going gold"—is a term used when software is ready for or has been delivered or provided to the customer. It is typically used in certain retail mass-production software contexts—as opposed to a specialized software production or project in a commercial or government production and distribution—where the software is sold as part of a bundle in a related computer hardware sale and typically where the software and related hardware is ultimately to be available and sold on mass/public basis at retail stores to indicate that the software has met a defined quality level and is ready for mass retail distribution. RTM could also mean in other contexts that the software has been delivered or released to a client or customer for installation or distribution to the related hardware end user computers or machines. The term does not define the delivery mechanism or volume; it only states that the quality is sufficient for mass distribution. General availability or general acceptance (GA) is the point where all necessary commercialization activities have been completed and the software has been made available to the general market either via the web or physical media.